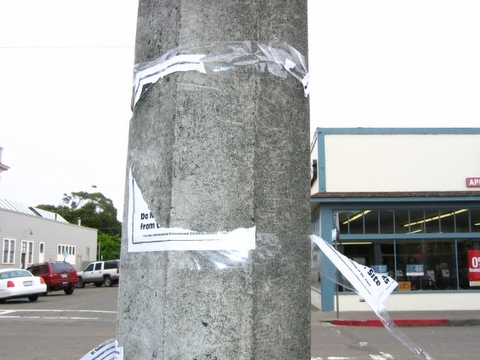 I was walking down Main Street this morning on my way to an appointment when I noticed all the utility poles, including the ridiculous faux cast iron utility poles on Laurel and Franklin, had been papered with signage. I made a note to return after my meeting to investigate the situation further. This sort of thing is not at all uncommon here. Various groups post things flaming issues, or each other, and it makes for good old fashioned entertainment. This is the great thing about living in a country where we are allowed to do things like this–I can make a bunch of posters that say “Dave Turner poops” and post them all over town, if I so desire. Especially with issues like this, which pit the traditionally blue collar roots of the town against the upstart hippies, posters are part and parcel of the debate. Clearly, the signs were put up overnight or in the small hours of the morning, because they weren’t here yesterday. It is equally clear that someone felt passionately that they should be removed, because I had to search to find the two above. So who removed them? City Hall boosters not wanting tourists to get a bad impression of Fort Bragg? An enraged private citizen? Someone in the pay of G-P? Who are the Concerned Citizens exactly and what is their deal? I applaud them for their activism, but I think they might want to consider something a little more difficult to shuffle under the carpet. The posters strike me as a little shrill, but also a good public service announcement. There are dioxins on the Georgia Pacific site. This is not in question–G-P itself admitted that dioxins were found in ash piles, ground soil (up to nine feet deep! ), and in “sediment from various ponds up to 14 feet.” The level of concentration at which the dioxins were found exceeds federal standards, and now the City is facing cleanup of the site before any grand schemes can be realized. The Advocate has been reporting on the contaminents like it’s a major shocker–it’s not. Most people in the area were aware that the mill site was hazardous, and that G-P probably engaged in some questionable business practices while they were busy destroying the ecosystem. Now, it appears that some civic controversy may be brewing over the issue, if these posters are any sign. 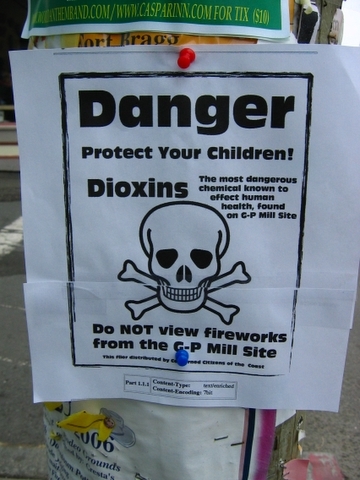 Dioxins, for those not in the know, are not good things. I feel like the skull is a pretty good indicator, and certainly no one is going around town putting up signs that say “DANGER! 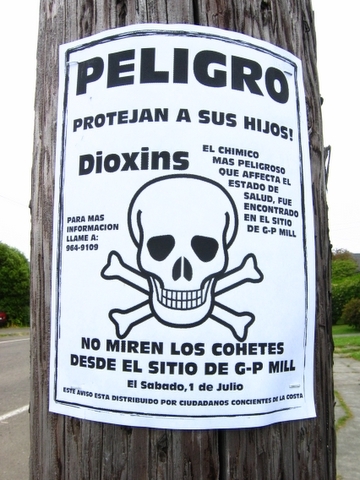 Kittens on G-P Mill Site!” Dioxins have been linked with birth defects, cancers, erosion of dental enamel, endometriosis, diabetes, immune compromise, and respiratory illness. They are not good things for humans to be around in high levels, and they are also a common side effect of industry. Globally, we are trying to work to reduce the amount of dioxins, because they are persistent, and they bioaccumulate, and neither of these things are groovy. It is likely that G-P burned treated wood and utilized the incinerator for trash burns (indeed, the hospital used to take advantage of the incinerator before they got in trouble). As a result, the mill site is contaminated–probably with a variety of things, not just dioxins. Now, the City is curious to know exactly how contaminated, and so is the state–to that end, full testing reports have been requested. The question is what we are going to do about it. The mill was obviously trying to negotiate sale of the land to the city before the extent of pollution was realized. Are we going to try to make it a Superfund site? We can’t afford the cleanup and the mill is probably going to weasel out of it, if they can. Can we force the mill to clean it up, and how will the entire affair affect the future of the land? There doesn’t seem to be much rational dialogue on the issue. It’s going to be interesting to see what happens with the fireworks. Traditionally, people have snuck onto the mill property to watch because it affords the best view. Last year, it was opened up to parking–this year, apparently police will guard the area to make sure no one enters the site. Since G-P hasn’t released the exact locations where dioxins were discovered, I’m not certain how dangerous the property is–after all, I and many others have been wandering around out there for years without any noticable ill effects. But this area does have a higher rate of cancer than one might expect, and this might be one of the reasons why. This is one of the things that goes hand in hand with the changes Fort Bragg is experiencing. We are more environmentally conscious now, and things like toxins are an issue. Especially since tourists aren’t going to be that interested in visiting a contaminated area. Make no mistake: declaring the site a Superfund would be a disaster for county tourism. But I think it’s important that this issue be out in the open and discussed, not hidden behind closed doors, because this is something that affects our entire community. I don’t care if it would hurt our economy: I want to see the right thing done, and I would like to see G-P exposed for its role, as well. Others probably feel differently. Such is life in any town, large or small.